Insert Row Shortcut in Excel | How to Insert Row using Shortcut? How to Insert Columns Using keyboard Shortcut key? In Microsoft excel mostly we used to add and delete the rows and column to edit or add more data information .we can insert or delete the rows and column by using the shortcut or we can do it manually. These shortcuts help us to insert or delete the rows using the shortcut keys on the keyboard. In Microsoft, excel rows can be inserted either by using the keyboard shortcut or by using the right-click menu or we can use the insert cells menu which will be the default cells menu in Microsoft Excel. The Keyboard Shortcut Key for inserting a new row is “SHIFT+CTRL++” and the same can be used to insert the new column too. Using Shortcut Keys to insert a new row. Using Insert cell menu to insert a new row/column. Using Right click key to insert a new row/column. How to insert rows in excel using right-click menu without Shortcut? First, select the row and choose above or below where you want to exactly insert a new one and then right click on the row cell then we will get the dialogue box where we will get an insert option and then click on the insert option so that the selected new row will be inserted as shown below. How to insert the column in excel using right-click menu without Shortcut? First, select the column where exactly you want to insert a new column. Right click on the column cell. We will get the dialogue box as shown in the below screenshot. Click on the insert so that a new column will be inserted as shown below. 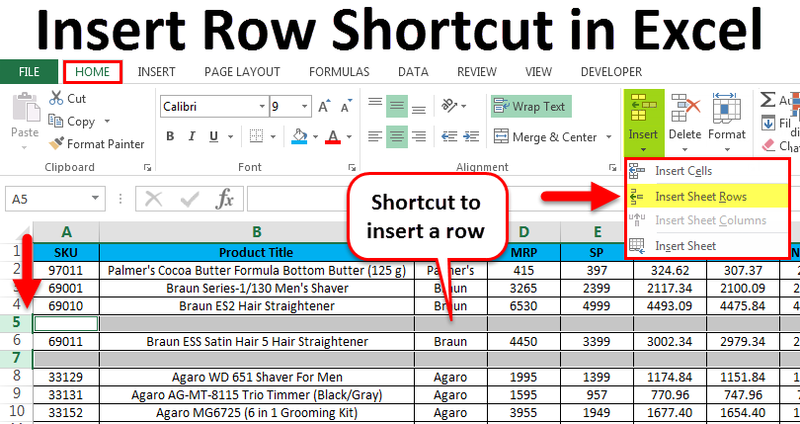 How To Insert Row in Excel using the ribbon menu. In Microsoft excel we can find the insert cells on the home menu which is shown in the below screenshot. Insert Cells– This is used to insert the selected cells. Insert Sheet Rows – This is used to insert the selected rows. Insert Sheet Column – This is used to insert the selected column. Insert Sheet– This is used to insert the entire sheet. Consider the below example which has sales data. Sometimes it is required to add additional rows and columns to add extra information in the data. So in these cases, we can insert the new cells or row in the worksheet which is shown in the below steps as follows. First, select the row where exactly we need a new row, here in this example, we have selected the Third row where we need to insert a new row as shown below which means Excel will insert the new row after the second row. Go to the HOME menu and select Insert and click on the Insert Sheet Rows option as shown below. After clicking on the insert option a new row will be inserted above the fourth row which is shown in the below screenshot. Now we can see the difference that new white row has been inserted after the SKU row “97011” Now if we need to add any missing Sales data we can enter the data easily. In this example, we are going to see how to insert multiple rows by following the below steps. Consider the sales data which has Product Title, Brand, and MRP etc. Assume that we have missed some sales data that we need to include rows at selected one. Here in this example, we are going to insert multiple rows by following the below steps. First, select the highlighted where we are going to insert the new one as shown below. Now click on the Insert and click on the second option “Insert Sheet Row”. After clicking on the Insert Sheet rows a new row will be inserted as shown in the below screenshot. Now do the same step to the other row to get the multiple rows, as shown in the below screenshot. In Microsoft excel we have several shortcut keys for all function where we have the shortcut key for deleting the row and column also. The shortcut key for inserting the row is CTRL +SHIFT + ” +” (plus sign) and the same shortcuts can be used for inserting COLUMN for the same. Mostly we will be using the number pad for inserting numbers. We can also use the number pad shortcut key to INSERT the row and the shortcut key to be applied is SHIFT+CTRL+”+”(Plus Sign). First, select the cell where you exactly need to insert a new one as shown below. Use the keyboard short cut key Hold SHIFT + CTRL Key and Press “++“ plus sign on the keyboard, So that a new row will be inserted as shown below. Here we can see the difference that after “PALMER COCO BUTTER FORMULA JAR (100 G) “two rows have been inserted as we noticed in the previous screenshot. Consider the below example where we are going to insert a new column. In order to insert new column using keyboard shortcut follow the below steps. First, select the column where exactly we need to insert. Now apply the shortcut key SHIFT+CTRL++ Once we hit the shortcut key a new column will be inserted which is shown below. In Microsoft excel inserting a new row in workbook helps us to add additional data and wherever requied we can simply insert the row and can be edited easily. While inserting new rows make sure that you have selected the exact rows/column.